It has almost been a year since that sad day when the bell rang at Athabasca School for the last time. The children have all moved on and integrated into other schools, however the school property remains. As a child, I attended Athabasca for nine years, and it has made me sad to see the school abandoned. Today it still stands vacant, with nature slowly taking over the play structures and basketball courts that were enjoyed by kids not more than a year ago. When the school closed last year, I predicted in an earlier post that Athabasca School would probably be torn down to build condos, or perhaps apartment buildings. It certainly looked that way, at least until recently. I went to the open house, and was most interested in what the City planners didn’t know, as opposed to what they did know. Apparently there was a Request for Proposals by Regina Public Schools and more than one proposal was received, but the City planner didn’t know how many or what criteria they were assessed against. Thus, the “proposal” of the Sihk temple is a done deal, and the City is just working on making it happen. I think I’m fine with it, however it is hard to assess without knowing details of the other applicants. Another issue I have (besides the general ignorance of the City planner) is that my house did not receive a mailout with the details of the applicant’s proposal. The City Planner said that policy requires houses in the immediate area (70 metres) to be sent mailouts, but since this development is “so significant”, they expanded that to 140 metres. Although I am further than 140 metres (perhaps 141 metres), I can see Athabasca School from my house, and am a little distressed that 140 metres is considered a sufficient radius for notification of such a significant change in use of a school facility – which in many regards is the focal point for the entire neighbourhood. In the gym section of the building, the Sikh Society will be converting this area to a worship center – a Sikh Temple. We were informed that during their regular worship sessions, their patrons use floor mats, therefore there would be no renovations involving the installation of seats and the like. In the smaller rooms located on the first floor, the Sikh Society will use these mainly as classrooms for activities for families, youth, elders, etc. It is possible that they may convert one of the rooms to a kitchen and dining area. There are several classrooms on this level, and to date the Society does not have any exotic plans to renovate this area. In the future, they do see using the space to house their priest and other staff as required. The space directly south of the main entrance will be prepared to add parking spaces as required by the City of Regina bylaws. The playground equipment currently occupying that area will be moved to the west end of the school grounds. The Society intends to maintain the total external property as green space wherever that is allowed. Their current facility is on north Lewvan (across from the old Empiringham’s building), and they have outgrown this building. The Society indicated that they would definitely be seeking to open the doors to others who may be interested in renting space, and are willing/want to participate in any local community events. It is important to mention that renters of the facility would not be permitted to bring in alcohol or meat and smoking is not permitted. 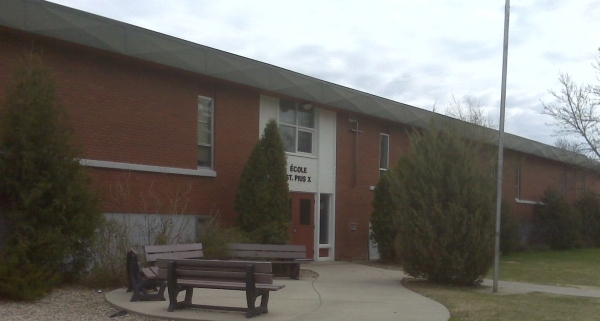 It is noted that there is a City of Regina sign outside of Athabasca School notifying the public that there is an application in place to convert the space from educational institution to a religious institution. Apparently, there were several proposals for the purchase of the building and school grounds, and the application by the Sikh community was accepted. So, in general it seems like mostly good news to me. The Sikh Society of Regina made a proposal for a relgious institution, and it was accepted by the city. The building will be renovated to suit the needs of the Sikh Society, and for the most part the outside will be kept as a greenspace for the public to enjoy. The Sikh society is willing to rent out facility space, and participate in community events as well! The Sikh temple thus has the potential to become a community hub, a space where we as a community association could potentially run programs. The only downside to the whole situation, was what Amy observed. There seems to be a definite lack of communication between the city and communities, and the LCA has found this to be evident in more than just this situation. The fact that several bids were put up for the Athabasca site is information that perhaps the community should have been made aware of. Nevertheless, I think that the addition of this religious institution will be a splendid addition to our neighbourhood, and build community ties better than condos ever could. I will be sure to keep you updated as this project moves on. Schools in Regina are being closed on a yearly basis. And there are no new schools being built. The student projections for the end of the renewal plan are alarming. It is projected that over thirteen elementary schools in Regina will exceed 400 kids by 2018. The highest projected population is Hawrylak School, where it is estimated some 923 students will be attending school by the year 2018. Two more schools are cited for closure at the end of this school year, and who knows how many more are coming after that. Lakeview and other neighbourhoods are full of young children that will be attending elementary school in the next few years. Supposedly, our city is growing and yet for some reason schools are closing. Instead of building additional schools to support a growing population, kids are being crammed into schools that are already full, and temporary classrooms (like the trailers you see on construction sites) are being slapped onto the backs of schools as a weak attempt to solve the problem. As a city, Regina seems to be behind in the times when it comes to debates on school closures. Larger cities such as Edmonton have put a moratorium on school closures for the next few years in order to “explore a number of programs to support schools rather then close them”. In Vancouver, “specialty programs have been introduced in order to give struggling schools the chance to survive.” There has been loads of research done has to show the benefits of multiple small schools rather then few large schools. So then why is Regina closing the doors of so many small, community schools? One of the reasons probably has to do with finances. Schools are expensive. Buildings need to be maintained, and that costs money. It is easy to close a school when one looks at all of the money that will be saved. The only thing that seems to be overlooked is what is best for the kids. A local group called RealRenewal has some great ideas on how to shape the future of education in Regina. They envision small schools that kids can walk and bike to. They see elementary schools as a hub for local community activities, such as adult education and daycare. Imagine having schools that aren’t just schools, but community centers that get used after school hours. Communities would be brought together! Neighbours would get to know each other! The benefits would be enormous. A city’s education system is its most important service. This is why such a large portion of our taxes is allocated to the school boards. Schools are more important then garbage removal. Schools are more important then street sweeping. Schools are even, dare I say it, more important then building a new stadium for our beloved roughriders. The school board should be looking out for what is best for our community, not what is best for their accounting ledgers. If you wish to express your concern about the future of Regina’s public schools, feel free email our ward’s school Board Trustee, Dale West. The above views expressed are those of the authour and not necessarily those of the Lakeview Community Association. Despite some resistance from the community, the Regina Public School Board voted to close Athabasca School this week, along with the English program at Ecole Massey School. Children from Athabasca can choose to go to Connaught, Argyle or Lakeview. My guess is that most kids living in the neighbourhood will probably go to Lakeview, as it will now be the closest school within walking distance. The Regina Public School Board has made it clear over the past few years with the closing of other schools that had small populations; such as Herchemer and Robert Usher Collegiate that they prefer large educational institutions compared to small community ones. I went to Athabasca (Class of 2005) and loved it. The small population definitely made Athabasca a great school. Teachers, regardless of what grade they taught, knew you by name and took an interest in you. The classes were not overpopulated and extra time and attention was given to you by the teacher because of this. Many parents volunteered their time at Athabasca and as a result of this, you got to know everyone’s parents as well. Small elementary schools strengthen community ties and generate amazing students. The days of the small community school are gone, as school boards across Canada prefer large schools with high populations and a student-to-teacher ratio so high that the teachers aid knows the students better then the teacher does. I am glad that I was able to grow up in a small school, it’s unfortunate to think that the children of the future will never be able to have that experience. Hurry! The Wedding Singer Opens Tomorrow! Sheldon Williams Collegiate is known for a great music and drama program and their fall musical is one of the highlights of their schedule. This year the students are getting back to the ’80s with a production of “The Wedding Singer.” It’s a lighthearted blast from the past — go find your skinny tie, put on your Member’s Only jacket and come sing along! or at the door if available. The student’s have been working long hours for many weeks to pull the show together and it’s going to be an awesome show. Come join the fun! Last Tuesday, I had the privilege of meeting with parents and teachers of Ecole St. Pius X Catholic School to learn about what they are up to and share the story of the new (and hopefully improved) Lakeview Community Association. It was a fun meeting, not only because parents who care enough to get involved in the community are my favorite type of people, but because there is a LOT going on at St. Pius School. One thing I knew going in is that they are working on a ton of fundraising for new playground equipment. They are busy with a mix of straight up fundraisers (like Mabel’s Labels, see below) and fun activities like a spring carnival that can also raise a few dollars. The LCA has been able to help a little with a Community Improvement Grant and we helped each other this winter when St. Pius parents supervised the ice shack at Lakeview Rink. There is still more for the crew to do, but it looks like they will be able to pull the project off. Good Luck! It doesn’t matter how often I see a project like this, it still takes my breath away at the huge effort and dollars involved. The fact that we have so many playgrounds in the neighbourhood is a testament to the hard work that goes on in the community year after year. My message to the parents was one of thanks and cooperation — thanks for the work they do (like most volunteers, the people around the table pitch in in activities beyond the parent council) and cooperation in terms of sharing their story. Sharing stories is a big part of what the LCA is about — if we can spread the word and connect the wide range of volunteer groups in the community, then I think we’re making a contribution. Speaking of sharing, St. Pius parent Maureen Jickling shared a really cool fundraiser they are running between now and September 14. 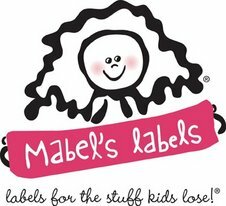 They are selling Mabel’s Labels — preprinted labels to put on all the stuff that kids lose, like camp gear, shoes, hats and the traditional underwear. They look really cool and original and sound like a great idea even if it wasn’t a fundraiser. But it IS a fundraiser, so go order two! You can get Maureen’s take on the fundraiser here, or just click here to order some labels. As we mentioned before, this new public school will have the largest impact to the youngest children in our community, and those children still to come. They need to be part of the journey! Please forward this story or a link to the Lakeview Community Association website to all the new parents, expecting parents, or future parents in the neighbourhood — they need to be part of the discussion! The dates have been set for the next three meetings to design a new public school in the greater Lakeview community. As we reported a couple weeks back, Regina Public Schools is combining Argyle and Athabasca schools and building a new school in the neighbourhood. The dates for the next three sessions have been made public. Now’s the time to tell all your neighbours and be part of the design process! This is an interactive workshop where everyone can share their vision for a new school. What do we want to see? What do we want to avoid? This meeting will have the architects share concept designs based on our input from the Visioning meeting and their experience designing new schools in Canada and around the world. We get to give more feedback based on the concepts that are presented. This presentation starts getting more concrete. School site designs are presented specifically for the existing Athabasca and Argyle sites (or additional sites if some come up) and advantages and disadvantages described. After this meeting the final recommendations and decisions will be made by the school board. It’s so very important that if you have young children, or care about public schools, or care about community development, or care about attracting young parents to the community, that you attend these sessions and share your ideas! Let’s fill the gyms with people and ideas and build something that will last for decades to come! Photos are from Fielding Nair International. The main picture is of a community design session for the new North Central Shared Facility in Regina. The headline is a conceptual design of a small school in Rhode Island. Feeling left out? Want to stay in the know? Then subscribe to LCA email updates and you’ll never miss a thing! We’re Getting a New School! We’re Getting a New School! Residents of Regina’s Lakeview neighbourhood will be embarking on an exciting journey this spring, as they work to design a school for the future in our older neighbourhood. It’s part of Regina Public Schools’ 10 year renewal plan, which will renovate, refresh and combine several schools around the city over the next decade. This is an amazing story of urban renewal taking place right in our neigbourhood. It will affect half of the children currently in elementary school, but the biggest impacts are to the youngest children, and those children still to come. They need to be part of the journey! Please forward this story or a link to the Lakeview Community Association website to all the new parents, expecting parents, or future parents in the neighbourhood — they need to be part of the discussion! Residents of Regina’s Lakeview neighbourhood are embarking on an exciting journey this spring, as they work to design a school for the future in our older neighbourhood. It’s part of Regina Public Schools‘ 10 year renewal plan, which will renovate, refresh and combine several schools around the city over the next decade. At a meeting to kick off the planning process on February 11th, parents and community members from the three public schools in Lakeview — Athabasca School, Argyle School, and Lakeview School — got the low down on a vision for investment in our community unlike anything we have seen in our lifetime: the replacement of two 50+ year old schools with a school designed around the needs of 21st century children. Attendees received an overview on the range of future education needs, various ways children learn, and how the needs of tomorrow are different from the schools of the past. They also discussed how modern school design can support these new learning requirements and be flexible to adapt to more changes in the future. The presentation was led by Randy Fielding of Fielding Nair International, an internationally renowned architecture and design firm who specialize in building schools for the new Creative Age. Fielding Nair have been involved in over 200 school renovations and new school designs in 26 countries, from Nunavut to Tasmania to Regina, most recently with Regina’s North Central Shared Facility. The stories and designs shared by Mr. Fielding were amazing to behold. In school after school on every continent, Mr. Fielding explained how adjusting room sizes, combining private and public spaces and integrating indoors and outdoors (even in cold climates!) could enhance the education of children of all ages. From large k-12 facilities in Indonesia, to remodeled schools in Minneapolis, to new learning centres in Rhode Island, attendees saw an overwhelming range of possibilities. The meeting kicked off the next phase of a renewal process that has been going on for 3 years already. This phase gets down to business — visioning sessions for a new facility in March, potential site plans in June, final decisions in October, then construction, with a planned Grand Opening in September 2012. The current RPS Renewal Plan calls for Athabasca School and Argyle School to combine around a new or renovated facility. At the February 11 meeting, school board administrators stated that while facilities reviews are still underway, it’s looking like neither structure will support the level of renovation that is expected, which means a new school would be built. Lakeview School is not officially included in this stage of the renewal plan (the school will be reviewed toward the end of the 10 year plan) but many current Lakeview parents attended the meeting. Given the open boundary policy employed by RPS, it’s unclear how many students in the Lakeview School ‘serving area’ might rather attend a new, modern school once it is built. Over the coming month, all community members are encouraged to get informed about and involved with this exciting new project. We have the opportunity to build a school that will be the envy of all Regina, that can be a huge attraction for existing residents and new families looking to locate in Regina. Let’s leave a lasting legacy for the next generation of students!